This has to be the ultimate power distribution board (PDB) for any mini quad. It's much more than just a simple PDB, it's better described as a power hub. It has both 5v and 12v regulated BECs, a LED light controller and even lost plane finder & low voltage alarm functions. 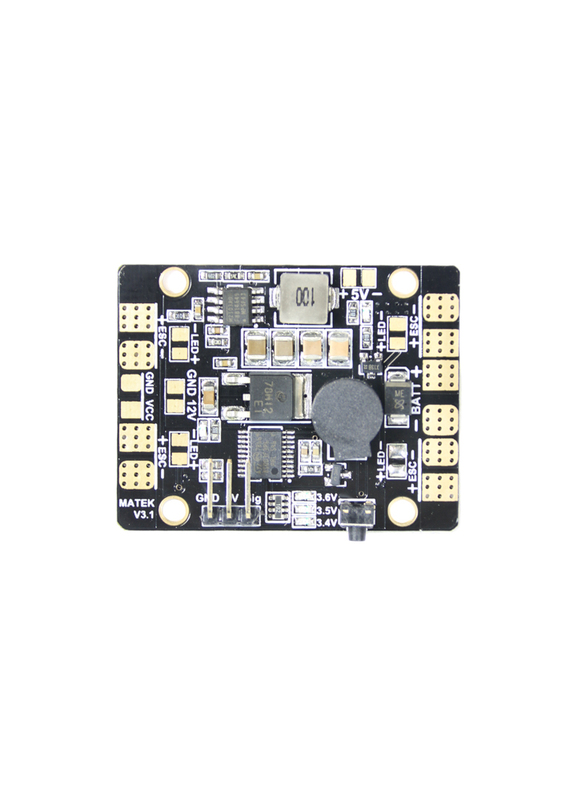 The board has been designed to suit FPV mini quads and help simplify their builds. The 5V 3amp BEC is ideal for powering a flight controller (FC) or RC receiver (Rx). Its wiring is a doodle, simply use the provided servo cable to connect your FC/Rx directly to the 5v aux pins to get power. On the other hand, the 12V BEC output has been designed with FPV systems in mind and could be used to power a FPV camera or FPV transmitter. To step down the flight battery voltage to 12v, it uses a linear regulator, which is better than a switching type regulator for FPV applications. A linear regulator reduces output voltage ripple and does not emit radio frequency interference, like switching regulators sometimes do. Aside from the power hub functions, the board also features four 5v LED connections and a LED light controller that can be operated remotely via the aux channel or via the push button on the board itself. The LEDs can be switch on/off and set to three different working modes: constant, slow flash or fast flash. In addition to the LED controller, the board also features a buzzer, which can be activated to help you find your model in long grass, or act as a low voltage alarm. Once the voltage gets below the threshold you set, the buzzer & LED light will activate to alert you that it's time to change batteries. The V3 is the latest edition of the Matek's 5 in 1 power hub and features big improvements over the V2 board. The PDB is now made of 2oz copper for even greater current carrying capability. On the V3 board, the BECs operate independently of each other, so you can now run 5 and 12v outputs at the same time. Finally the layout of the board has been much improved. While the board is slightly larger than a typical 36mm sized PDB like the V2, the V3 features the standard M3 30.5mm square mounting holes, so it can still be stacked cleanly with the CC3D, Naze and most other board type flight controllers. It even comes with nylon spacers and fixings for this. 5V is also on the Aux pins + & -. Linear regulator, very low noise. Don’t use the BEC 12V to power VTX or Gimbals when 6S battery is in use. Total 4 pairs LED light pads, All the LED lights have the same status. Choose the modes: Tune on the LED first(move the switch to value 1700-2000), then move the switch to middle position & side position within 0.5s. Beep once. If no cable is connected to RX Aux channel, the button can be used to change the modes. Use the same Aux channel with F3 function. Middle position is OFF (Value=1400~1600). Move the switch to value=1000~1300, the buzzer & LED light can be triggered. Beep & Flash(2Hz), which can help you search the models in tall grass or trees. Set the “SERVO REVERSE” in transmiter to change the switch position of F3 & F4. The 5in1 can monitor 3~6S LiPo voltage status & notify you once the cells reach the defined voltage. Input voltage rise again, the alarm will be suspended. The Buzzer & LED light status of F5 has priority over F3 & F4.